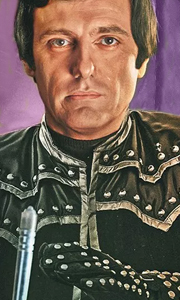 Own Blakes 7 Series 1 to 4 Complete Collection DVD from Deff, DVD, Blu-Ray & 4K Video Specialists - Free UK Delivery.. The entire first season (remastered) of the 1970s BBC sci-fi series. In 'The Way Back' resistance fighter Roj Blake is found guilty of false charges and sentenced to imprisonment on Cygnus Alpha by the corrupt Federation. 'Space Fall' sees Blake and fellow prisoners Avon and Jenna escape from their prison shuttle and take possession of a mysterious spaceship, which they name the 'Liberator'. 'Cygnus Alpha' finds Blake attempting to resc.. The entire second season of the 1970s BBC sci-fi series. 'Redemption' sees Orac's prediction of the Liberator's destruction looking likely to be fulfilled when the ship's original owners arrive and take the rebels prisoner. In 'Shadow', Blake becomes involved with an interplanetary crime syndicate. 'Weapon' sees Blake and crew set out to steal a deadly 'delayed-effect' gun, which Servalan also wishes to possess. In 'Horizon', the Libera.. The entire third season (remastered) of the 1970s BBC sci-fi series created by Terry Nation. In 'Aftermath', the crew abandon the Liberator in the wake of the Andromedan attack. Avon is rescued by Dayna and her fugitive father. 'Powerplay' sees Avon and Dayna battling for control of the Liberator with Federation officer Tarrant, while Cally and Villa are hostages in a sinister hospital. In 'Volcano', the crew of the Liberator, with Blak.. The entire fourth, and final, season (remastered) of the 1970s BBC sci-fi series created by Terry Nation. 'Rescue' sees the crew rescued from the planet Terminal by a mysterious stranger, whose plan is later revealed when they arrive on Xenon. In 'Power', the crew struggle to get to the spaceship Scorpio, and are joined by Soolin. 'Traitor' sees Avon making the discovery that Servalan is still alive, and using a pacifying drug to subdue..
Own Blakes Seven DVD from Deff, DVD, Blu-Ray & 4K Video Specialists - Free UK Delivery..